Thanks for your article. I've been brewing KT since December. I use the continuous style as suggested by the Happy Herbalist guy. 1. Cover it tightly in the fridge? I guess it would run out of O2 eventually anyway in a closed fridge, so maybe it's a moot point. 2. My SCOBY has never sunk. Do you think I should see if it can be persuaded to sink, so it will have the protection of the acidic KT? -I would say loosely cover the SCOBY in the fridge. The cold temperatures will slow down the activity of the bacteria/yeast significantly, but not completely. So why not just give the bacteria a little more oxygen just in case they need it?...and even though the fridge will be closed, O2 can probably still get in, because if you unplug your fridge, everything inside does not stay cold, so air must leak from somewhere. -So what depends on whether your SCOBY floats or not is how much CO2 is trapped inside. (And if you see any CO2 bubbles on your SCOBY definitely squish them). Also, more CO2 indicates more yeast activity. -You may just want to place a larger mushroom in a smaller glass jar. I sometimes brew with my larger SCOBYS in smaller jars (so it's placed in sideways/slanted), & this can prevent your SCOBY from floating. Hope this helps, & if you have any more q's feel free to ask! I have had a mother in a glass jar for over a year. Do you think that it will be safe to try to brew her? She's always been kept in a dark room and has liquid in the jar with her. -If the mushroom and the kombucha it was stored in look/smell ok, I say it doesn't hurt to try! Be cautious though. If it looks suspicious, you may just want to start with a new one/grow your own! -If you're worried that your starter tea is too acidic/old to ferment with, and if you don't have starter tea (although kombucha starter tea is preferable), you can also substitute 2-4 tbsp of distilled white vinegar for starter tea if you are brewing four quarts. You can read my comment on using distilled white vinegar as a starter tea substitute in this post: http://kombuchafuel.blogspot.com/2009/02/one-gallon-kombucha-sweet-and-maybe-not.html. Hope this helps! Sometimes it takes a bit of time for a SCOBY to get adjusted in a new environment. Some posts that are related to your question include "Kombucha Mushrooms Come in All Shapes, Sizes, and Colors" http://kombuchafuel.blogspot.com/2009/04/kombucha-mushrooms-come-in-all-shapes.html and "Q&A: How do you grow a thick kombucha mushroom?" 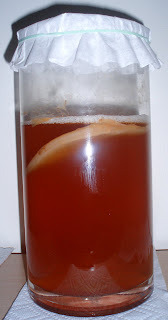 http://kombuchafuel.blogspot.com/2010/05/q-how-do-you-grow-thick-kombucha.html. Another site that I have found helpful is Kombucha Balance. http://users.bestweb.net/~om/kombucha_balance. If you have any other questions please ask. Good luck! I didn't know about the not storing in the fridge until now. My SCOBY has been in my fridge for quite some time and it's all brown. I am trying to kick start it again...but is it dead? It floats to the bottom of the jar. Thanks for leaving a comment! When you said "not storing in the fridge" did you actually mean it's ok to store in the fridge? Whether your mushroom sinks or floats is not a problem. And even if the mushroom is all brown, I think it would still be worth giving it a try to brew with it! It would be good to have some starter tea when you're brewing, as well (perhaps this was what the SCOBY was sitting in?). Good luck! I have a similar question and that is our mushroom has been stored in our fridge for 5 or 6 months with a lid. I took it out a bout 3 weeks ago, same container, same very old tea and still covered. It certainly doesn't seem active as I'm sure it has nothing to eat. It's very thick, does not smell and I'm going to give it a fresh brew today as soon a sit cools. Any advise? It is not moldy but I wonder about the thickness, acidity and other possible things I can not see. One last question: A mushroom grew in my organic Bragg apple cider vinegar. Do you think it would be safe to use this one? Thanks so much for your time and advise.! Thanks for leaving a response! I think it never hurts to give it a try brewing with the old mushroom to see what happens. If it doesn't work, it's not like you didn't try! It may also help to start brewing with smaller batches in the beginning (such as 1 or 2 quarts). If/when you do get a new baby mushroom though, I would probably dispose of the older one (such as in the compost). The acidity of the tea that the mushroom is stored in does help to act as a preservative, helping to prevent other foreign organisms from proliferating. I think it would be fine to use the mushroom that grew in your vinegar. There is a SCOBY/Mother of Vinegar debate, which I discuss here http://www.kombuchafuel.com/2010/10/kombucha-scobys-vs-mothers-of-vinegar.html. It would be interesting to see if kombucha brewed with this mushroom tasted different (or the same or similar) from kombucha brewed with a "true kombucha SCOBY." As you can probably tell, I'm all about the experimentation! I attempted to make tea about 9 weeks ago. I had to leave the area for a while and just got home. SCOBY looks fine, one sank and the other was floating. I got rid of the tea as I did not know if it was safe to drink. I placed SCOBY in a ziplock with some of the tea. I guess I need to get a glass/ lidded jar. But before I do, is it still safe for me to use the SCOBY I have? I doi not see any mold...maybe I should have savedthe tea? It smelled pretty acidic and tasted like vinegar...but thats normal. I would still try brewing with the SCOBY, and move it to a glass container ASAP. It never hurts to try, if you don't detect anything strange regarding appearances or odor, and it's normal for the kombucha to taste very acidic & vinegary if it has been brewed for a longer period of time. The kombucha might not good to drink if it's overly acidic, but it can be used for starter tea. You might also be interested in some of these other recipes and uses for extra kombucha: http://www.happyherbalist.com/KOMBUCHA_recipes.htm. you mentioned to try with differet teas and sweetners witht the extra SCOBYs. What would be the ratio for honey in a quart of tea? For brewing kombucha with honey, I would add approximately 3 tbsp honey per quart of tea. (Please note that my recipe is not as sweet as some other kombucha recipes, so feel free to add a little more if you'd like). Hi! I have read that fermenting with honey is not as good as plain sugar as honey has antibacterial properties. I would prefer to use honey if possible, but don't want to make the Scoby unhappy. Thanks. I must have something really wrong with my intestines/gut because when I drink kombucha, I feel absolutely unbelievable. I cannot believe this fermented tea is so amazing. I drink caffeine and it does give me energy, but kombucha gives me this kind of pure ALIVE energy that is so amazing. Drink this stuff. It works. I'm glad that you are enjoying kombucha and feeling good after drinking it! @Jennifer I wrote a blog post regarding brewing kombucha with honey here: http://www.kombuchafuel.com/2010/05/q-can-you-brew-kombucha-with-honey.html. could i make a scoby with lemon ginger kombucha? I am going away for 5 weeks. Could I just make new batch of tea and sugar and leave it lightly uncovered at room temperature? Yes that should be fine! If you have a metal lid you may want to use a layer of plastic wrap as well. Have fun on your travels! You should make a SCOBY only using raw, unflavored kombucha. Other flavors such as ginger and lemon can harm the health of the SCOBY. That is why flavors are normally added during the second fermentation/the bottling process. Hi. I received my first mother from a friend about a month and and half ago-i have not done anything with her yet...When I received the scoby the Mason jar had a lid on it and I didn't know any better to remove the lid so it can breathe...any I also have not added any day sugar tea mixture. In your opinion, do you think it's still alive? Thanks for your message! I cannot say for sure if your SCOBY is alive. However, I think that it's still worth trying to brew with it and to see what happens! If you brew with the culture and a younger SCOBY grows, you can discard the older one. Or if you try brewing with the SCOBY and it does not seem to take, perhaps your friend has another spare kombucha culture? Best of luck!